Make a donation to Dragstrip 66: The Frockumentary today. Film Independent’s Fiscal Sponsorship program opens the door to nonprofit funding for independent filmmakers and media artists. Donate today and help bring Dragstrip 66: The Frockumentary to life. Never before seen archival video reveals the untold story of an underground LGBTQ nightclub that became a political and creative center for a community besieged by AIDS and discrimination. As club owners Paul V. and Mr. Dan prepare for the Dragstrip 66 finale, patrons, staff, and celebrities reflect on their memories and impressions as Dragstrip 66 comes to the end of its historic run. Trip down the rabbit hole of time to experience Dragstrip 66, a monthly underground nightclub in Silver Lake, Los Angeles that ran for an unprecedented 20 years (1993-2013). Dragstrip 66 was so much more than just a nightclub. It was a wellspring of creativity, it was a community of artists and survivors, and it was legendary. When Dragstrip 66 opened its doors in January 1993, HIV/AIDS had decimated the LGBTQ community for over ten years. As new medicines soon offered hope to a community that was ready to celebrate living again, the club provided that platform at a safe space when it was needed most. Featuring provocative live performances, cutting-edge dance music, and subversive drag, crossdress and masquerade, Dragstrip 66: The Frockumentary gives the audience an immersive experience that simulates the exciting and celebratory vibe of the club. The packed dance floor hosted everyone from anarchic queens and punk hipsters to grunge fans and A-list celebrities. And this radical, creative explosion of fun and freedom forever impacted the social landscape of LA, all prior to our social media age. 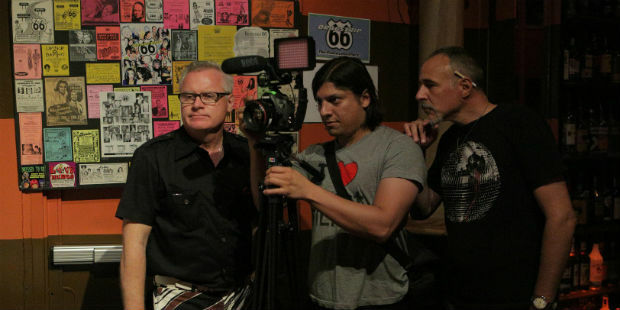 Dragstrip 66: The Frockumentary is a feature-length documentary that will chronicle the 20-year history of a nightclub space that set the stage for an embattled LGBTQ community ready to resuscitate gay/queer culture. Co-creators Mr. Dan and DJ Paul V. provided this all-inclusive space that blurred the lines between audience, performer, and sexuality that invited everyone to participate in its misfit-inspired magic. Make a donation to Dragstrip 66: The Frockumentary. Phil Scanlon is a film education leader who produced the Harold Lloyd Master Seminars for the American Film Institute. He has hosted appearances many notable guests including Robert Altman, Robert Townsend, David Lynch, Ian McKellen and Edward Norton. Additionally, he has produced special events honoring writers Buck Henry, James L. Brooks and the writing staff of The Simpsons. He has also worked as a consultant for several film festivals including Austin Film Festival and Newport Beach Film Festival. Paul Vitagliano (aka DJ Paul V.) co-founded the club Dragstrip 66 with Mr. Dan in 1993. He’s been a highly-respected club and radio DJ since 1981. His varied music business career in Los Angeles includes positions as promotion executive at Warner Brothers Records, band manager (Jane’s Addiction), music reviewer (Frontiers Magazine), freelance press, PR and writing, and on-air DJ on Indie 103.1FM radio from 2005-2009. In early 2011, he created the blog, BornThisWayBlog, a photo/essay project inviting gay adults to share their childhood stories and photos. The blog has logged over 4.5 million hits since its inception and has been featured on CNN, ABC News, NPR, Salon, Buzzfeed and many other press outlets. In October 2012, Quirk Books published the “Born This Way: Real Stories of Growing Up Gay” book, based on his blog. Robert Garren studied film at the University of Southern California where he learned both film critical studies and film production. He has over nine years of experience in business and project management which he brought into the creation of his production company. He has since produced, edited and directed with creative partner Mike Celestino multiple music videos, short narrative videos, commercial shorts and documentaries over the past 5 years. The most prominent production was the short documentary The Last Days of Cinerama which has shown in four countries in multiple film festivals and won the Best Documentary: Audience Award at the Dam Shorts Film Festival. It was reviewed by Leonard Maltin as part of the 60th Anniversary Cinerama Festival where he called it “revealing…unexpectedly bittersweet.” Robert Garren will be editing as well as helping manage the day to day production shoots for Dragstrip 66: The Frockumentary. A bizarre cosmic collision propelled Associate Producer Alaska Thunderf*ck to Earth in March 1966 and onto the fifth season of Logo TV’s RuPaul’s Drag Race in January 2013. Still radioactive, no one knows who or what she is yet, but no one cares, as long as she never returns to her native planet. Her age and species remain unknown to the public, but a few of her enemies claim to hold copies of her spawning record and universal passport.